At CP Shutters, we like to keep our pricing simple. Each of our ranges are priced simply by the total number of square meters you are purchasing. We do not charge our customers for rod choices, different hinge colours, or simply because your particular window is difficult to install. All of our prices include VAT, delivery, installation and our 10 year warranty, so there are no hidden charges. Everyone pays the same fair price, guaranteed. For a more in-depth guide to the cost of a project, check out our featured projects page, showcasing real projects and their costs. Remember if you would like us to visit your Home for a FREE Home Design Survey, then call 01702 68 69 70 or click here! By far our most popular product, the Elmstead range is our entry level shutter. Available in nine different colours including shades of whites and greys, this LDF constructed shutter is ideal for almost any window. With the option of five louvre sizes, offset, centre or hidden rod choices and sixteen hinge options, the Elmstead is one of our most versatile ranges, and the most affordable. To see a Shutter project featuring this range click here. The Blackmore is a product designed predominantly for larger windows and doors. The Basswood construction is much lighter than the Elmstead's LDF, meaning it can be used on unusually large windows and doors. Blackmore can be purchased in twenty two different colours including whites and greys with the option of four louvre sizes, sixteen hinge colour options, offset, centre or hidden rod choices and various design configurations available. The Blackmore range is an excellent choice for Patio doors and large bay windows. The Thaxted range is very popular with interior designers and design enthusiasts alike. Based on the same LDF construction as the Elmstead range, Thaxted also has the advantage of ABS louvres, giving the product unrivaled durability, ideal for homes with pets and small children. Thaxted's main advantage over other ranges is its array of colour options. Available in twenty two standard colours, with bespoke colours based upon Farrow & Ball paints also available to order. Thaxted has five louvre sizes and the three rod choices of, centre, off-set and hidden as well as sixteen hinge colours to choose from. 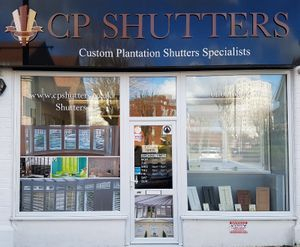 At CP Shutters we can even offer Shutters for Bathrooms & Kitchens. The Fambridge range has been designed specifically for this purpose. Available in twenty two different colours including whites and greys, the Fambridge features a construction completely encased in ABS resin. Along with stainless steel mechanisms and hinges, this makes the Fambridge range completely submersible! Ideal for windows directly next to showers and baths, and resists any damage from moisture during cooking or homes vulnerable to damp. The Fambridge has a choice of five louvre sizes and three rod choices of centre, off-set and hidden and comes with marine grade stainless steel hinges. The lightest material available on the shutter market. Abberton is a beautiful range constructed out of parasol wood. This unique material allows our designers to create interior wood shutters for virtually any size window or door. The Abberton range is available in a stunning collection of fifty colours, each featuring an elegant wood grain finish. You can also choose a custom colour option (ask one of our experts for more information) so there is no colour scheme we can't compliment. With Abberton, we can also create custom shapes such as circles and arches, no window is too awkward. Abberton has a choice of five louvre sizes as well as solid panel options, three rod choices of a centre, off-set and hidden rod and sixteen coloured hinges. Our premium shutter product, created using the finest Solid White Teak, the Emerson range is the ultimate luxury Shutter. With a finer grain than the Abberton range, the Emerson really does make a statement when you walk into a room. An excellent choice of finishes including the ever popular Limed White & French Oak. The Emerson, like the Abberton can be customised into any shape, has a forty eight standard colours plus a custom colour option and is available with sixteen hinge choices. Emerson can be built with eight different louvre sizes, solid panel options and three rod options. The Emerson really does look incredible in any setting.